Shortlisting of candidates for Interview will be done on the basis of the marks in qualifying exam details for the same are given. Application must be minimum academic qualifications required are M.Sc. or equivalent in any branch of science, or M. Tech or MBBS or M.V.Sc or M. Pharm or equivalent qualification as per the norms of Jawaharlal Nehru University (JNU), New Delhi along with 60% aggregate score or equivalent grade in Senior Secondary Certificate (10+2) and bachelor’s degree, and at least 55% aggregate score or equivalent grade in Master’s degree is required. The Institute invites applications from candidates who have completed or are likely to complete the required courses this academic year. Candidates appearing for the qualifying exam this academic year may also apply; they will be admitted provisionally pending satisfactory fulfillment of the above requirements the time of joining. Channel-2: Joint Graduate Entrance Examination in Biology and Interdisciplinary Life Sciences (JGEEBILS-2019). 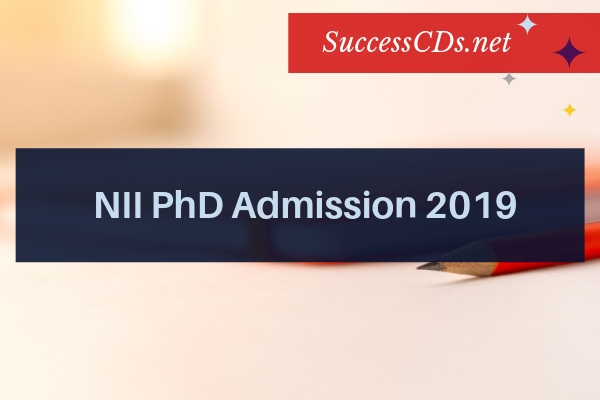 Candidates applying through JGEEBILS-2019 must submit an application through NII Application Portal, along with application fees and the JGEEBILS-2019 admit card. The list of candidates shortlisted for Interviews shall be available on the NII website and Notice Board on or before 15th March 2019. Reservations of seats - 15% for SC, 7.5% for ST, 27% for OBC (non-creamy layer) and 3% for Physically Handicapped as per statutory norms. Applications should be submitted online only (visit website www.nii.res.in); online application facility will be available at NII website. Online Application Fee is Rs.1000/- for General /OBC (NCL) Applicants and Rs.500/- for SC/ST/PwD (non-refundable). The institute currently provides a Junior-Research Fellowship of Rs.25000/- per month. Selected candidates who are already fellowship awarded from CSIR, UGC, ICMR, DBT, and DST may avail those fellowships as per rules governed by the respective funding agency.